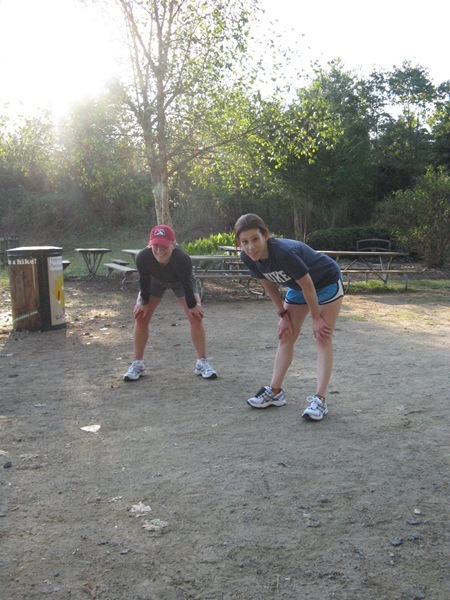 Up and at ’em at 6:26 this morning to get ready for a run with Sarah! Sarah + Josh arrived right on time and I took them to the Greenway for a cool refreshing sprint! Sarah is FAST and we knew we’d be pushing our pace to the max running together with my latest focus on speeding up. 52:54 minutes and 6.2 miles later…. This was definitely my fastest run ever. (Excluding sprint 5K’s). But the Greenway is pretty flat. I was huffing and puffing the whole run – in a good way! It’s nice to be out of breath again and my body has that wonderful tired feeling after a long run. Go Sarah! Once home, it was time for a big debut. The first pumpkin oats of the season. I’ve had this can since last winter but honestly had NO TASTE for pumpkin all summer! 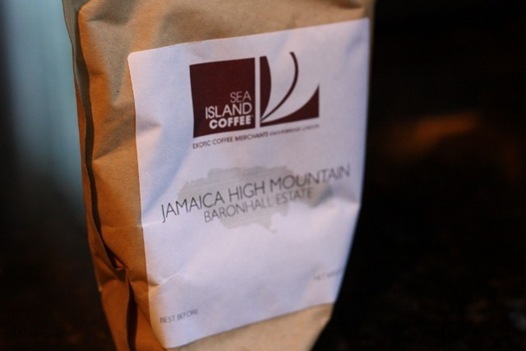 On the coffee front I tried a new Sea Island Coffee: Jamaica High Mountain Baron Hall Estate. It was awesome! I can’t believe the time again!! And it totally feels like a Saturday. I am SO excited about the next few days – gorgeous weather, NO TESTS, lots of assignments to get checked off my list 🙂 I’m going to make that Gmail video soon too! We’re meeting Sarah + Josh for lunch and then I have class tonight, so I better get going! i love those starbucks city mugs! 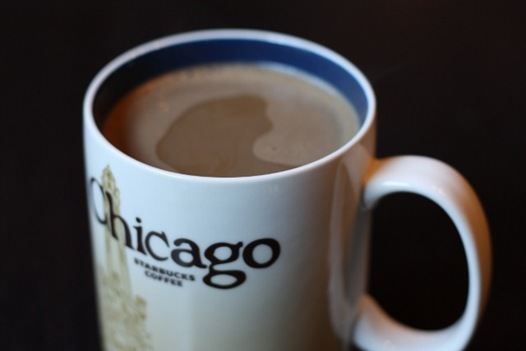 Love your Chicago mug! We are excited to see if we get the 2016 Olympics here, the announcement is tomorrow…crossing my fingers! Great job on the run…nothing feels better than a GREAT workout!! your run sounds so refreshing!! wow awesome run! it’s helpful to have a running partner that pushes you. 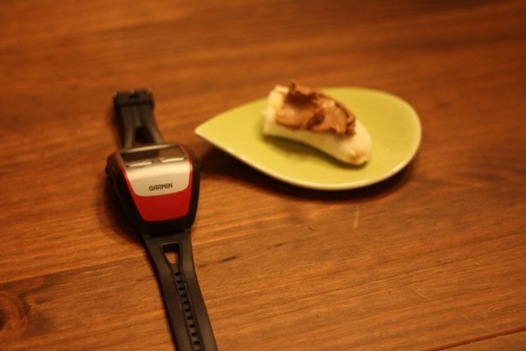 My husband just got me a garmin for my birthday can’t wait to use it! jealous of your run! makes me feel guilty for still being in bed haha… i need to find libbys!! all my stores are out! Great run! I need to get some pumpkin ASAP! Yum. Pumpkin is the best. 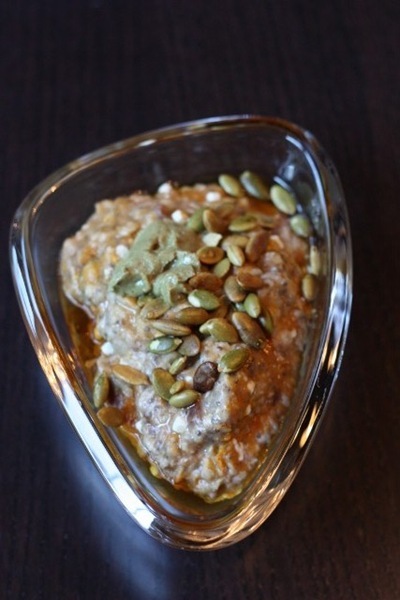 I had pumpkin oats this morning too courtesy of Stonyfield’s seasonal pumpkin yougert which was absolutely amazing! Dang..i just dropped grains from my diet and looking at your photos makes me drool. I want my oatmeal back NOW!!!!!! 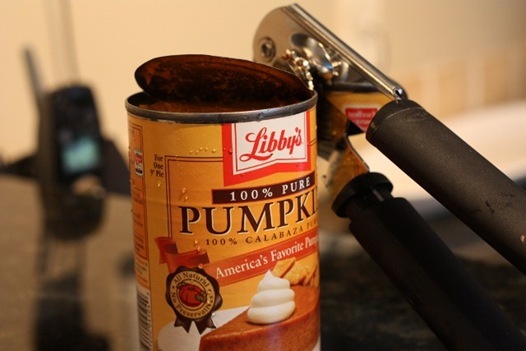 Congrats on a great run – I need to plan some pumpkin meals coming up – I have four big cans of them (28 oz size)! 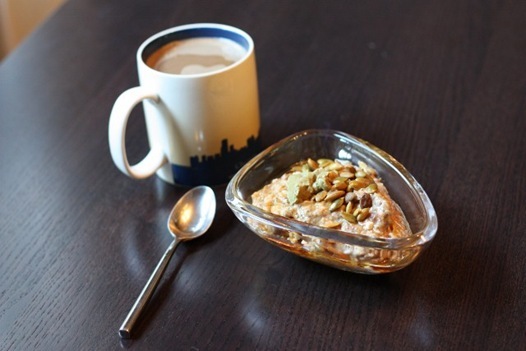 What a great way to start the day: a run and pumpkin oats! I bought a pumpkin last week and made pumpkin soup and pumpkin risotto! I love that fall means pumpkins. Kath, you always have the best dishes. Where did you get that bowl? holy fast run batman!!! dang! your breakfast puts my oats to shame… looks pump-tastic! Pumpkin oatmeal, yum I still have never tried it. I would never think to add cottage cheese to my pumpkin oats. Does it change the flavor? I made mine today with just the spices, chia seeds, agave, oats and water. speedy run! what a great way to start the day huh. im going to try pumpink oats today after reading this. LOVE your starbucks mug. i collect them from all the cities ive been to but dont have chicago. yet. if you like pumpkin you should try the new stonyfield pumpkin pie yogurt its really good! and I have a new blog, called eating for abs on worldpress..everyone should check it out! I smile every time I see the Chicago mug. 🙂 Reminds me of home! Awesome run with Sarah! She’s a good running buddy. Gmail Gmail Gmail! . . . also, that dish is so interesting. It’s time I finally got around to trying pumpkin oats. I love pumpkin stuff in the fall! I almost made butternut squash oats this morning but then realized I didn’t really want them. So unlike me! I’m totally loving the pumpkin theme during the fall. No better time to eat pumpkin! yay for pumpkin! Love that you included some seeds! yay for pumpkin oats! I have it on my “to buy” list for this weekend. Yum! I love the pumpkin oats. I had some for breakfast, though I might have to alter my recipe a bit and try yours! 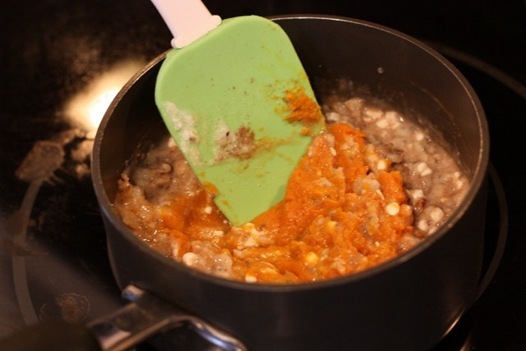 I love fall, but the only problem is that my husband isn’t a fan of pumpkin – whereas I love it! – so I’m hard pressed at what to make with it. I guess I’ll keep it all to myself! I wish it was a Saturday! I’m so excited for pumpkin season! And yay for pumpkin oats! What a great way to kick off October! I had pumpkin oats this morning too! Of course, I have been eating them all summer because I l-o-v-e pumpkin! You have definitely inspired me to add cottage cheese to my morning oats. It’s definitely pumpkin time. I had no desire over the summer, but yesterday I was just overwhelmed with this desire for something pumpkiny. I guess its fall! I also have no taste for pumpkin in the summer but I’m happy to have it back in my life! I’ve been hemming and hauling about whether i should go running outside, go to the gym, or go to hot yoga tonight after work. This post just convinced me that I should go running outside! Wow!! That is a great run!! 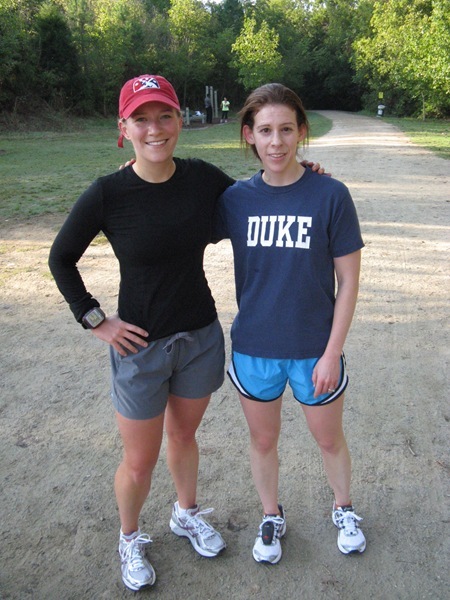 I think its so awesome that you get together with other bloggers and go running! I wish I had that luxury!! I don’t really have any bloggers in my town. What an awesome run! It always feels good to start your day out with such a great workout under your belt. LOVE that oat mixture. Perfect fall comfort food! i have yet to have my first pumpkin of the season – it’s still hot in los angles!!! that sounds like an awesome run and workout. Its great to have someone to do it with!! Hi Kath! Hi Sarah! Representin’ Duke!! Woohoo! What beautiful weather we’ve had this week in NC, huh? I also got a can of pumpkin from Super Target last winter on clearance and glad I saved it now that Fall has arrived! congrats on having no tests and have a great lunch with friends! great job on the run!!!! i love pumpkin~ what a neat bowl. Your coffee looks so delicious! It makes me want to go make a cup! Great job on your run, that is amazing! And yay for the first pumpkin oats of the season. I’m so happy it’s fall. Sarah’s outfit looks jussssssssst like mine! Duke T shirt and nike tempo shorts! Re. 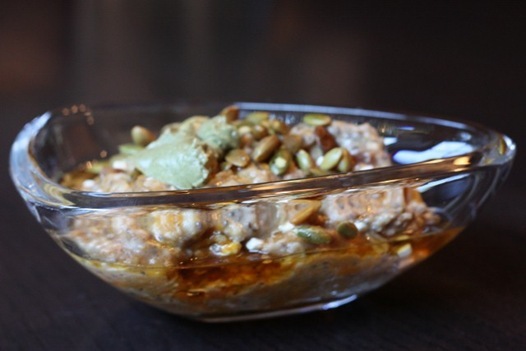 SF Pumpkin Yogurt – I have not spotted this yet, but my eyes are peeled!! Why’d you drop them in the first place! Go eat some oats!! It was a gift from Mara @ What’s For Dinner. It does change the flavor- cream cheesy! I think seaweed salad is in CalorieKing’s database. It’s probably a better guess than me. I will run my fastest!!! And that was a loong run..i do my daily 21 mins run, and i’m pooped! Just bought pumpkin butter based on your post! Thanks for the suggestion! 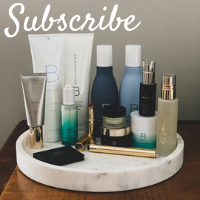 Just wanted to let you know that I love your blog!! 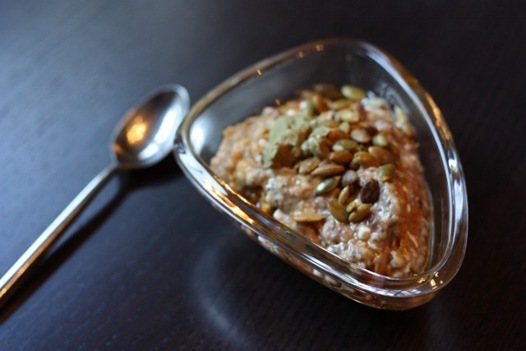 Your oatmeals are inspiring and look delicious! I’ve passed your blog along to many friends and family. Keep writing! And running! Oh and btw, friends are now posting on my facebook wall that they love your blog. Wanted to pass along the love! And, saw that you’re from Charlottesville. I’m originally from northern Virginia. 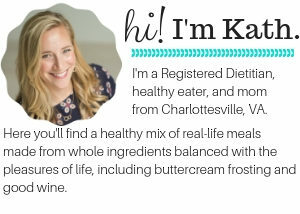 A family friend is a nutritionist in the Charlottesville area. Do you know Nancy Muir? She’s wonderful! Don’t know if you’ll find this, but nutrition and calorie counts would be great. I am dealing with a health problem by NOT taking medications and supplements, but I do need to keep at 14oo calories a day. Part of that day must be oatmeal, again for nutrition reasons. It looks like your recipe here would be near my total daily calorie allowance. I’m enforced sedentary, so I can’t eat much more but could play with the numbers if you gave it all here. And RDs usually have access to a program for that, don’t they? Try NutritionData.com or CalorieKing.com for calorie information and even to put in a recipe and get a count. My oatmeal bowls are usually 400-600 calories, which is 1/3-1/4 of the normal daily allowance. For someone on a 1400 calorie per day diet, I’d go with 400 per meal and a 200 calorie snack. I’m very interested to follow the site of an RD. I’ve subscribed. Thanks for the suggested website.